Chynna has trained in the ADAPT exam syllabus her whole competitive life studying in jazz, tap and ballet, this season successfully completing her PreAdvanced Jazz. She has been a demonstrator for 3 years at the Acrobatic Arts workshops. She has taken part in the Aerial and Back Handspring training, as well as the Back Tuck and Back Layout training. In addition she has also completed level Pre Professional 3 of the Acrobatic Arts and is striving to complete the whole program to become Acro Certified. Chynna has travelled to multiple out of town competitions, as well as local ones. At these competitions, she has received many judges choice awards, scholarships and the “Junior All Around Bowl” in 2011. Along with these achievements, Chynna was voted “Dancer of the Year” in 2013. 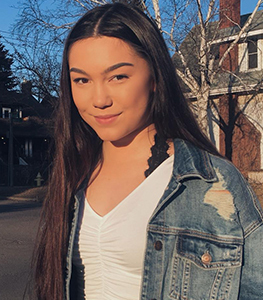 She has received numerous school awards, including The Athletic Award, The Christian Living Award, The Academic Award as well has been on the Honour Roll in both grade 9 and 10. While being a student and teacher at Dance Dynamics Studio, Chynna is also a student at St.Ignatius High School. During her time there, she has taken part in the musical “We Will Rock You” as a dancer/ensemble. Chynna is looking forward to another great dance season with Dance Dynamics Studio.